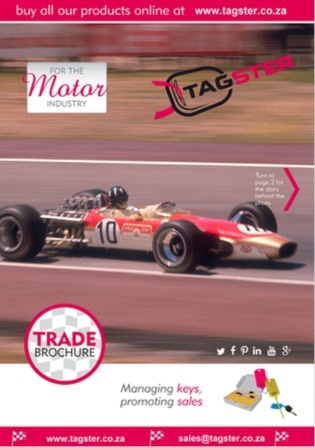 TAGSTER’s track record of high quality motor trade goods and outstanding customer service spans more than a decade. We understand about the needs of a busy car dealership, and our Johannesburg based company offers a wide range of products to help you manage, protect, and promote your business. In addition to key management, we also provide superb Forecourt Display products. Our ever-growing Dealership Essentials range also offers useful and indispensable products for your company, including stationery, key cabinets and wall planning systems. With a wide range of own brand products available alongside many other motor trade essentials, please feel free to email our knowledgeable and helpful sales team at sales@tagster.co.za. We’ll be happy discuss your requirements with you.